Biography of Baroque Painter of Landscapes, Battle Scenes. One of the most versatile Old Masters of Baroque art, Salvator Rosa had exceptional talent in oil painting and printmaking (engraving, etching) as well as poetry and music. A quick-tempered, flamboyant individual, he specialized in landscape painting and battle scenes, but also produced a large quantity of portrait art, allegorical and history painting, as well as religious art and a series of witchcraft paintings. He is especially well-known for his wild and fantastic landscapes, marked by a feeling of dreamlike melancholy (in contrast to the classical serenity of Poussin and Claude) - see, for instance, River Landscape with Apollo and the Cumaean Sibyl (1650-60, Wallace Collection, London), and Landscape with Tobit and the Angel (1670, Musee des Beaux-Arts de Strasbourg). These landscapes had a significant impact on the 19th century school of English landscape painting, as exemplified by the works of John Martin (1789-1854). Rosa began his career as part of the Neapolitan School of Painting (1600-56), but spent most of his life in Florence (1640-9) and Rome, where he finally settled in 1649. One of the pioneering Romantic artists - reputedly he fought by day and painted by night - his reputation declined during the late 19th century, after his landscape pictures were dismissed by John Ruskin (1819-1900) as artificial. Ironically, one of his most famous pictures is his Self-Portrait (1641, National Gallery, London); see also Self-Portrait (1645, Musee des Beaux-Arts de Strasbourg). The battle-painter Aniello Falcone (1607-56) was an early influence, as can be seen in The Battle (1637, London), in which the scene is painted from life without attempts at idealization or glorification. In Rome, Rosa became connected with the Bamboccianti who specialized in small paintings of peasants and low life. He studied mainly with Van Laer, concentrating on genre painting and common scenes, such as the Bambocciata. Large-scale works, such as Doubting St Thomas (Viterbo Museum), reveal the influence of Jusepe Ribera (1591-1652) in their almost macabre tenebrism (Rosa may, in fact, have been Ribera's pupil). About 1639-40 Rosa turned decisively towards classicism, already familiar in Naples through the Neapolitan Baroque painting of Guido Reni (1575-1642), Domenichino (1581-1641) and the geometric paintings of Viviano Codazzi (16061670). But it was in Baroque painting in Rome, where the Greek-inspired classicism of Nicolas Poussin (1594-1665) predominated, that taught Rosa most about the poetic depiction of nature. His preference for a certain type of classical landscape is seen in two paintings of 1640: Seascape and Hermione Carving the Name of Tancredi (Pinacoteca, Modena). Both pictures clearly demonstrate the principle that truth should be subordinated to the ideal of beauty or to an idealized representation of nature. However, Rosa never wholly committed himself to the idea of a perfectly arranged classical landscape. He included in his painting figures of ordinary people while his natural tendency towards the picturesque gave animation to, and sometimes even dissipated, the 'ideal' design. In the ensuing years, however, in the learned and academic circles he frequented in Florence, he drew nearer to the classical style, as seen in 1645, in works which have a new nobility of content: The Philosophers' Forest (Pitti Palace, Florence). Side by side with his classicism he experimented with another style based on ugliness, even repulsiveness, in which esoteric themes were dominant (Sorcery, Private Collection, Florence). Towards 1650 Rosa abandoned his earlier, serene approach and depicted nature in a more lively and disturbed fashion. St John the Baptist Preaching and Baptism in the Jordan (Glasgow Art Gallery) are the most characteristic works of this period. 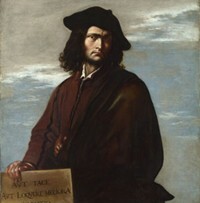 The growth of Rosa's reputation (Magnasco and Marco Ricci followed his style) stemmed from his development of a style of anticlassical landscape painting, the romantic counterpart to Claude Lorrain (1600-82). It was a style that was to earn an ever-increasing popularity, culminating in the work of the 19th-century Romanticism across Europe. Rosa (who was also an etcher and a draughtsman) was a prolific artist. His landscapes, marine paintings, historical, biblical and mythological scenes can be seen in several of the world's best art museums, notably: Pitti Palace, Florence; Louvre, Paris; Art Institute Chicago; National Gallery, London; Walker Art Gallery, Liverpool; National Gallery, Melbourne; Detroit Institute of Arts; Musee Conde, Chantilly; Kunsthistorisches Museum, Vienna; and Wadsworth Atheneum, Hartford, Connecticut.  For more about Italian Baroque painters, see: Homepage.  For an evaluation of important paintings, see: Famous Paintings Analyzed.